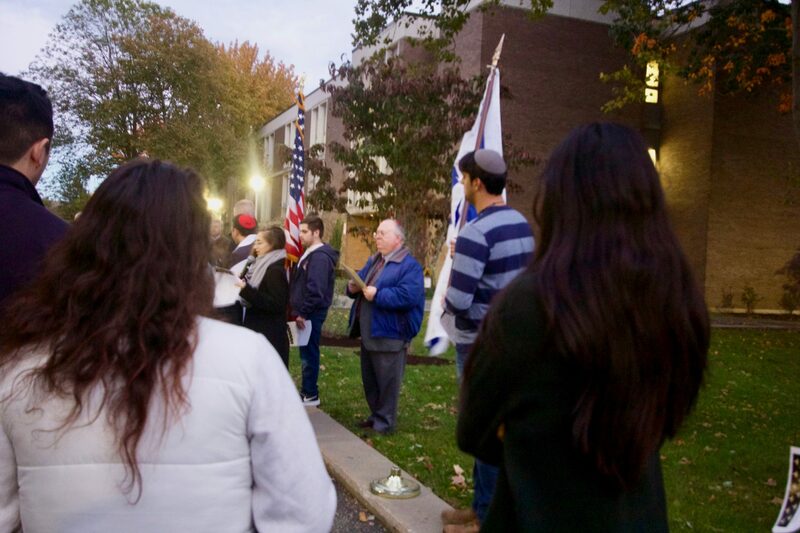 Stony Brook University’s Hillel organization held a candlelight vigil on Monday, Oct. 29, in remembrance of the 11 people who lost their lives to an anti-Semitic attack in Pittsburgh. The attack hit the Tree of Life Synagogue in Squirrel Hill, a residential neighborhood in Pittsburgh on Saturday, Oct. 27. It was the deadliest anti-Semitic in the history of the United States, claiming 11 lives and injuring at least six others, including four police officers. Stony Brook Hillel, which works to be a home away from home for Jewish students at Stony Brook, held this event so that students could process their feelings in the wake of this tragedy. About 200 people attended the vigil, ranging from students, faculty, community members and members of the interfaith community at the university. At the beginning of the vigil, Rabbi Joseph Topek, who has been a Rabbi at the university for 37 years, spoke to the attendants, urging them to remain strong and remember their common humanity in this time of tragedy. “It is up to each and every one of us to build a society where no one lives in fear because of who they are,” Topek said. As 11 candles were lit, the student lighting each one announced the name of the victim they were lighting it for. Not a single person whispered a word as several speakers, including representatives from the Muslim Students Association, Roman Catholic Ministry and the University’s Office of the President, asked people to embrace unity and hope and shun hatred during this crisis. Some students at Stony Brook felt the impact of this anti-Semitic attack on a deeper and more personal level, particularly the President of Seawolves for Israel and active Hillel member, Neil Dasgupta, who grew up in Squirrel Hill, just down the road from the Tree of Life Synagogue. Dasgupta said that he was shocked to see the news and the very first thing he did was reach out to his friends and family to make sure that they were okay. He recounted his memories of Squirrel Hill in a short speech that he delivered to the attendants of the vigil, mentioning how he frequently drove by the synagogue on his way to school. Topek said he felt the vigil gave the community “an opportunity to grieve.” He also believes that people must move forward from this event unafraid.